The last time I was at White Stadium the game was won on the last play. Hopefully we'll have a similar ending today. Kickoff in 10 minutes. After failing to gain a yard on 1st and 2nd down O'Bryant's Kobe Smith found a wide open Emmanuel Exilhomme for a 63-yard TD. 6-0 Tigers. At the end of the first quarter O'Bryant and Latin Academy are tied at 6. O'Bryant cant get anything going and will punt. Latin Academy takes over. O'Bryant made tdown to the four yard line before running out of time in the half. Latin Academy leads 14-6 at halftime. Everett to receive. Let's do it. Bold move by Andover deferring to second half. 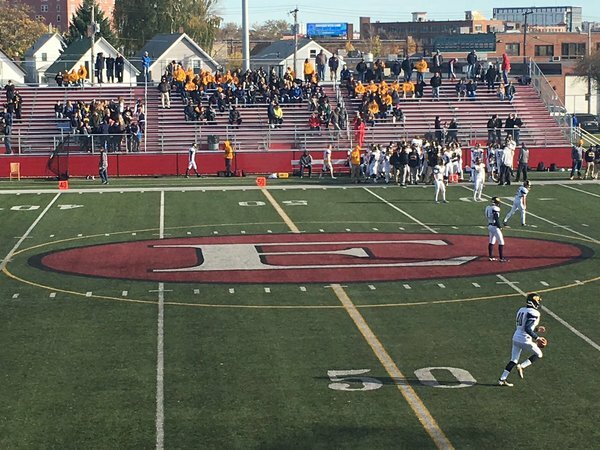 Everett has found the end zone on its first drive in both playoff games. My goodness that was quick. Three plays and a score for the Crimson, a 27-yard run from Marvens Fedna. 7-0 Everett just one minute in. Latin Academy is set to receive the kickoff and start the second half. First play of the ensuing drive, Jordan McAfee finds Mike Sainristil on a 58 hat catch and run in the flat for a TD. 14-0 Everett. Wow. Andover answers. Huge kick return from Cedric Gillette sets up the Perry keeper. 14-7 Everett, 5:26 in the first. Latin Academy gets a 29-yard TD on 4th-and-ten to take a 22-6 lead in the third quarter. No surprise, Crimson blinding Andover with pace and a heavy dose of Marvens Fedna. They're driving again in Andover territory. Jacob Miller from 1-yard out. 21-7 Crimson with 2:40 left in the first. Latin Academy adds another TD on a sneak by Teehan. The Dragons lead 30-6 in the fourth. Jason Maitre picks off Perry on the first play of the drive. Everett ball at Andover 32. 2 plays and another score. Chris Jenkins from 7-yards out on this one for the 27-7 lead. Too easy. 2:05 left in the first. End 1: Everett 27, Andover 7. Golden Warriors gaining some traction on O, have it in Everett territory. Still struggling mightily to protect Perry up front. Perry throws up a floater that is almost picked off by Maitre. Coach Perry livid, calls the timeout. Nice play by Gillette to break it up. On 4th and 9, Perry finds Joe Rockwell for a huge 10 yard score. 27-14 Everett, 6:54 left in the half. Sainristil, 93-yard kick return to the house. 35-14 Everett, 6:37 left in half. For as impressive as Perry is with the arm, he's been even more effective eluding pressure with his legs. Keeping Andover in this game. Andover turns it over on downs. Everett driving with 1:24 left in the half at the Golden Warrior 25. Jacob Miller goes 25-yards to find the end zone. This offense is unstoppable. 41-14, 1:15 left in the half. Perry to Gillette on a beautiful wheel route, 36-yards for the score. 41-20 Everett, 44 seconds left in the half. Halftime: Everett 41, Andover 20. CAN'T. KEEP. UP. Perry: 11-21, 192 yards passing, 2 TDs and a pick. Perry also has 77 rushing yards and a TD on 11 carries. Gillette: 5 catches 62 yds, TD. Meanwhile Everett has scored on all its drives save for the final one of the half when time ran out. Andover with no antidote. Andover starts on its 24 to begin the 3rd. Mike Sainristil intercepts a 5 yard out and takes it to the house on the half's second play. 48-20, Everett. Backbreaker just 19 seconds into the half. Andover front has struggled all day, but falling apart now. Three straight sacks force 4th and a bunch. Could we have our first punt? Jenkins again, from 44. Is this emphatic enough? 55-20 Everett with 6:21 left in the third. Carlins Platel with an interception to end a nice Andover drive. 8 sacks and 3 picks for the Everett D.
End 3: Everett 55, Andover 20. Jacob Miller with his second TD of the game, from 11 yards. 62-20 Everett, 8:08 remaining. Perry to Gillette, 18 yard TD. 62-27 Everett, 4:59 left. 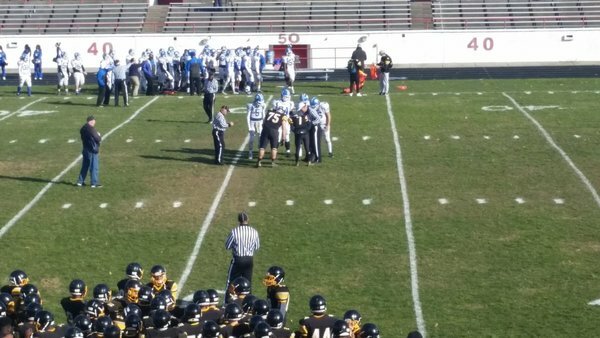 Onside kick recovered by Andover because of course. Perry 43-yard keeper for the score. 62-33, 4:29 left. Backups in for Everett on O.